Taste, nutrition and personal preference are the three main considerations for deciding whether or not to skin your apples. Juices made from skinned apples typically contain fewer amounts of vitamin C and dietary fiber, two essential parts of a balanced diet. Health benefits aside, skinning your apples before juicing may provide a sweeter, crisper taste for your juice. 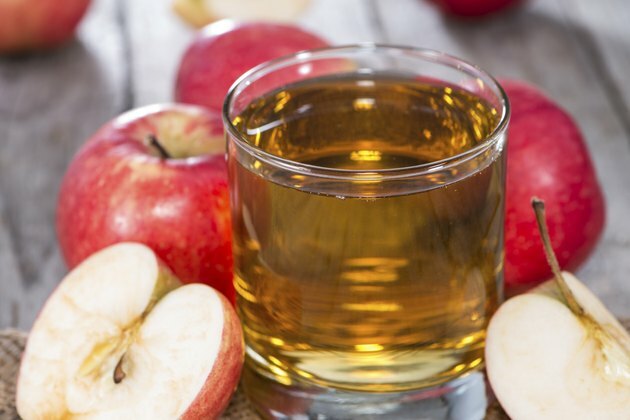 Of the hundreds of varieties of apples available on the market, Red Delicious, Honey Crisp, Gala, Fuji and Rome apples are commonly chosen for juicing because of their rich, tart flavors. If you decide to peel the apples, use an apple peeler or small knife to remove the skins before chopping the apples and placing them in an electric juicer. If no juicer is available, you can always derive your juice the old fashioned way by cooking the apples in water. According to the University of Illinois website, unpeeled apples are considerably more nutritious than peeled apples. Nearly half of the 8 milligrams of vitamin C is contained in part of the apple skin, along with practically all of the 4 grams of dietary fiber. The cells that generate the apple's fragrance are also contained in the skin, adding to the aroma and flavor of ripe apples. A medium unpeeled apple contains 73 International Units of vitamin A, 159 milligrams of potassium, 10 milligrams of phosphorus and 10 milligrams of calcium, with only 81 total calories. If you want to boost the nutritional value of your apple juice, keep the peels on. Juicing your own apples can be a tasty, inexpensive alternative to store-bought juices. Depending on what types of apples you purchase, it can also be a healthier choice. According to the US Food and Drug Administration, conventional apples may contain traces of arsenic due to the presence of chemicals in the water, air and soil. Depending on where your apples come from, you may be able to decrease your risk of drinking arsenic by buying local or organic apples grown with a minimum of pesticides and chemicals. Always clean your apples regardless of where you purchase them. Apple juice is considered relatively safe for healthy children and adults when consumed in moderate amounts. According to MayoClinic.com, individuals with birch pollen allergies may experience a variety of negative reactions when consuming apple products. Talk to your doctor if you experience any negative reactions to your apple juice.